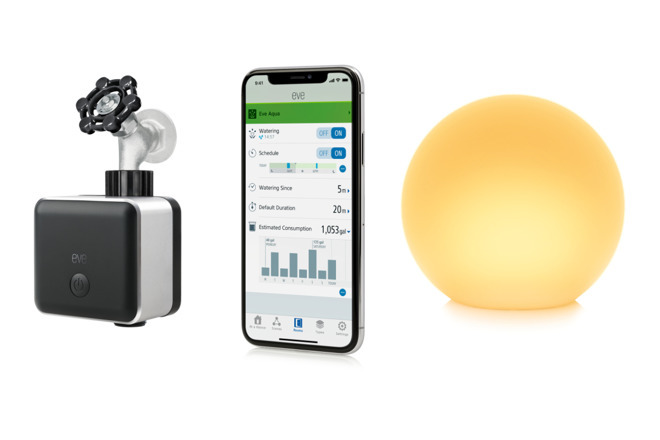 Both HomeKit accessories are arriving just in time for summer, with a clear focus on outdoor use. The Eve Aqua is a fully water and UV resistant smart water controller that will affix to a water faucet and help automate and measure garden/lawn watering and usage. It is a small square box, running on two AA batteries, that screws into place over an external faucet with a physical button on the front to allow for manual access. HomeKit support allows Siri to water the flower beds or turn on the lawn sprinklers, whether at home or away. Watering can be scheduled and adjusted from anywhere, based on the weather or your preferences. The Eve Aqua is also capable of tracking water usage, and automatically shutting off based on time or other HomeKit triggers. Like Elgato's other HomeKit garb, the Eve Aqua connects through Bluetooth. Eve Aqua is available for pre-order now, with full available ability slated for June 25, for $99.95. 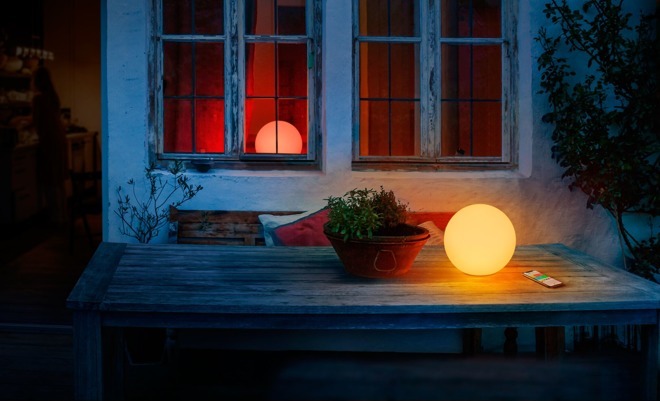 The Eve Flare is a spherical LED lamp roughly the size of a basketball that works indoors or outdoors. A built in battery keeps the Eve Flare running for up to six hours, and the device can charge wirelessly with an inductive charger. Elgato's Eve Flare has IP65 water resistance, twice the battery life of the competing Hue Go, and does not require a hub. It puts out around 90 lumens of light, well below the 300 lumens of the Hue Go. Eve Flare is very similar to the Elgato Avea Flare, though that model does not offer HomeKit compatibility. Eve Flare is also available now for preorder in Europe for 99,95, and will be shipping June 25. Though the HomeKit market is growing, any new additions are noteworthy, and that is certainly the case with both of Elgato's new additions. 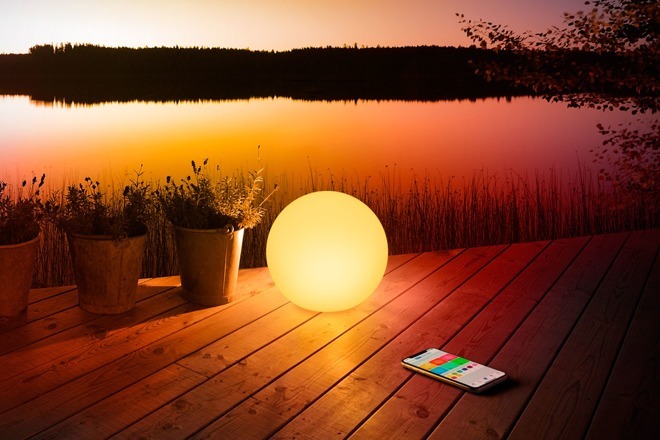 Options for HomeKit compatible portable lights and watering systems are currently extremely limited, with only a handful of other alternatives. Elgato has several other options for HomeKit gear, with the company several new products including the Eve Button (review) and Eve Room 2 earlier in 2018 at CES. AppleInsider was granted a first look at the Eve Aqua during the show. We expect to hear many new features coming to HomeKit soon at Apple's annual WWDC keynote, scheduled for June 7th. We have some requests for expansion of the feature, and have recently published a HomeKit wishlist.